I am so thankful for you all! I hope that today is filled with all the things that you are thankful for, even if it's just a bit of time that you get to take to draw, doodle or make a bit of art. Here is one of my all-time favorite things to draw-an acorn. This page of 20 ways to draw an acorn is from the book 20 Ways to Draw a Tree and 44 Other Nifty Things from Nature. I bet you could use these to dress up your Thanksgiving table place-cards or let the little ones try their hand at drawing some acorns while they wait for the feast. Eloise has a keen interest in mid-century art and design that influences her design aesthetic. Imagery, textiles, children’s book illustrations, and home interiors from the 1950’s, 60’s, and 70’s contribute to her unique, appealing style. She currently lives in Nottingham, U.K. View her work online at http://www.etsy.com/shop/EloiseRenouf. I can fully attest to the "zen" part of Zentangling! I combined my Easter crafting and decorating with my relaxing and winding down time by making a Zentangled Easter egg using the Zentangle tutorials in One Zentangle A Day: A 6-Week Course in Creative Drawing for Relaxation, Inspiration, and Fun. Click on this page from One Zentangle A Day to learn how to draw the Shattuck, Nipa and Jonqual Zentangles. I used a plastic egg and a fine tip Sharpie. It was a little slippery, but I wasn't too worried about perfection; I was simply enjoying the experience of following supper easy and clear directions. I am really happy with my Zentangle Easter egg! I keep spinning it around in the egg cup to look at it from all sides. One Zentangle A Day is a beautiful interactive book teaching the principles of Zentangles as well as offering fun, related drawing exercises. Zentangles are a new trend in the drawing and paper arts world. The concept was started by Rick Roberts and Maria Thomas as a way to practice focus and meditation through drawing, by using repetitive lines, marks, circles, and shapes. Each mark is called a "tangle," and you combine various tangles into patterns to create "tiles" or small square drawings. This step-by-step book is divided into 6 chapters, each with 7 daily exercises. Each exercise includes new tangles to draw in sketchbooks, teaches daily tile design, and offers tips on related art principles, and contains an inspirational "ZIA" (Zentangle Inspired Art) project on a tile that incorporates patterns, art principals, and new techniques. 1. Leave a comment here in this post by Midnight ET on Saturday, August 4, 2012 about your favorite "sweet" word, book, candy or other. 2. "Like" us on Facebook and give us a "shout out" over there. 3. Join our mailing list (top right column of the blog). 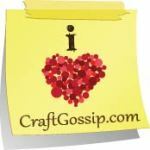 Go over to the Sizzix blog and leave a comment there! OK, now that you've got yourself in the running for some cool new Sizzix dies designed by Eileen Hull and Craftside books, check out some things I made using them. I simply L.O.V.E. these Sweet Treats Cupcake Stands but I thought they might just work for......yup! Jello Shots! I scored myself a couple of fun new shot glasses and I wanted to try them out with Jello! I used the Little sizzles 6" x 13" matt board pack with the Sweet Treats Cupcake Stands and cut out enough parts to make three stands. Then, to paint them, I used the water color dot painting technique from Water Paper Paint: Exploring Creativity with Watercolor and Mixed Media. I used the Sweet Treats For You Set by Eileen Hull die to make a set of three flower embellished toothpicks used to loosen the Jello from the sides of the shot glasses and to look cute! This little "window" book was made using the Sweet Treats Extra Long Candy Jars die, the Little sizzles 6" x 13" matt board pack, some recycled book pages and a bit of DMC floss. The tall jar tag was made simply by wrapping the variegated DMC floss around the jar die cut. I painted both with a bit of water color as well. I plan to fill the windows in the book with all sorts of little pictures that will be sandwiched between the recycled book pages. Sandra Salamony is a professional book designer. She has authored, coauthored, and curated several books on artisan topics. She lives in Traverse City, Michigan. Visit her online at http://www.sandrasalamony.com. Peter and Donna Thomas are book artists and coauthors of More Making Books by Hand. They live in Santa Cruz, California. Heather Smith Jones is a studio artist and instructor who received her MFA from The University of Kansas in 2001 and her BFA from East Carolina University in 1996. Smith Jones is represented by galleries nationwide and has completed residencies at Arrowmont School of Arts and Crafts and Virginia Center for the Creative Arts. Her work is in many private collections and in the public collections of the Sprint Corporation and Emprise Financial Corporation. Smith Jones also collaborates with other artists in photography and multi-media projects. She lives in Lawrence, Kansas with her husband. Visit her online at www.heathersmithjones.com. Click on this page from Brave Intuitive Painting to enlarge and read the full scoop on how to create two paintings at the same time. If you too are looking to kick your art side into gear, this Quarry book is for you! Adopt a spontaneous, bold, and fearless approach to painting as a process of discovery—one that results in lush and colorful finished works that will beg to be displayed. This inspiring and encouraging book for both novice and experienced painters teaches how to create colorful, exciting, expressive paintings through a variety of techniques, combining basic, practical painting principles with innovative personal self-expression. Flora S. Bowley's fun and forgiving approach to painting is based on the notion that “You don't begin with a preconceived painting in mind; you allow the painting to unfold.” Illustrating how to work in layers, Flora gives you the freedom to cover up, re-start, wipe away, and change courses many times along the way. Unexpected and unique compositions, color combinations, and subject matter appear as you allow your paintings to emerge in an organic, unplanned way while working from a place of curiosity and letting go of fear. She lives and works full-time as a painter in Portland, Oregon, where she is inspired by magical forests, abundant gardens and a vibrant community of fellow artists. Visit her online at www.florasbowley.com. Over at the Etsy blog there is a super cool tutorial on how to make eye dropper drawings by Carla Sonheim, author of the equally cool book Drawing Lab for Mixed-Media Artists: 52 Creative Exercises to Make Drawing Fun. Carla Sonheim's innovative ideas are now collected and elaborated on in this unique volume. Carla offers a year's worth of assignments, projects, ideas, and techniques that will introduce more creativity and nonsense into your art and life. Drawing Lab for Mixed-Media Artists offers a fun way to learn and gain expertise in drawing through experimentation and play. There is no right or wrong result, yet, the readers gain new skills and confidence, allowing them to take their work to a new level. Carla Sonheim is a painter, illustrator, and popular workshop instructor at art retreats such as Artfest, Art & Soul. She has been called a "gifted facilitator" and loves to help adult students recover a more child-like play approach to creating. Carla's "Girls" paintings are in showcased in numerous galleries nationwide, as well as in private and corporate collections around the world. Visit her at www.carlasonheim.etsy.com and www.carlasonheim.wordpress.com! Save this fall’s flower and vegetable seeds to make handmade paper cards that will bloom in the garden next spring! Learn how to make recycled milk jug skull Halloween decorations. This week's craft challenge is all about crafting with shoe boxes. Do you have a project to share? Aileen shows you how she created her ceramic mermaid tile. Do you dream of writing a book on your craft? Read a craft book editor's tips for ways to make a book proposal pop, plus a checklist of basic book proposal components.